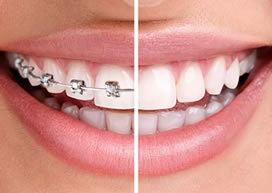 Why Choose Invisible Lingual Braces? You will be smiling like never before! 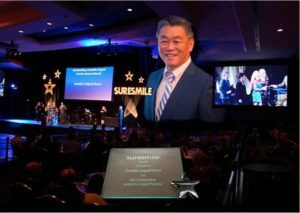 With 30 years of experience and using the most advanced technology, Dr Wong’s passion is creating beautiful smiles for children and adults. Whether using traditional braces (on the outside of the teeth) or lingual braces (behind the teeth), you will get the smile of your dreams! 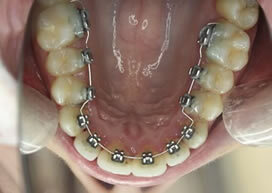 When most people think of beautifying their smile they assume they will have to endure 1-2 years of unsightly braces. Not so with Lingual Orthodontics and SureSmile! Lingual braces are hidden behind the teeth, and SureSmile decreases the time by up to one half, and improves precision of the outcomes for all types of braces. Why not look and feel your best, even during treatment! Any concerns with crooked, protruding, inverted or overlapping teeth, or noticeable spaces can all be corrected. Many adults seek orthodontic treatment for cosmetic reasons. However, many may seek treatment because of jaw pain, dysfunction, excessive wear or challenges with dental hygiene. Whatever your goals, we will devise the treatment plan to achieve a beautiful smile with a healthy and balanced alignment of your teeth and jaws. All of these patients are wearing invisible lingual braces. Invisible Lingual Braces is conveniently located right off the M1 Highway in Tweed Heads South, and only 15 minutes from the Gold Coast Airport. 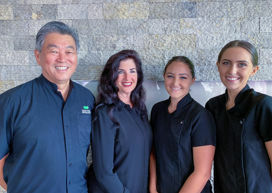 Dr. Wong has over three decades experience using all types of orthodontics while staying up to date with the most current advances in the field. He is dedicated to finding the best form of treatment to suit your individual needs and desired results. He has used Lingual Orthodontics for more than two decades. He has many exciting results to share with you at your first consultation. He is able to offer lingual appliances at costs comparable to the cost of traditional braces in most orthodontic practices. We treat every patient with the utmost respect, always giving them the education and information necessary to make their decisions about treatment. Questions from patients are always important and welcome. Our treatment coordinators take an educational rather than sales approach with our patients. We are treating patients from 7-64 years old currently. Your relationship with your Orthodontist is a long-term one, and we strive to provide optimum orthodontic care in an enjoyable environment. We invite you to experience what we have to offer, please call South Tweed Orthodontics on 07 5524 8400 to schedule a consultation.